June 20, 2008: Imagine landing on the Moon, climbing down the ladder of your spacecraft, and looking around the harsh lunar landscape—to see another, older spacecraft standing only 200 yards away. That's exactly what happened in November 1969, when astronauts Pete Conrad and Alan Bean stepped out of the Apollo 12 lunar module. There, within walking distance on the edge of a small crater, stood Surveyor 3, an unmanned U.S. spacecraft that had landed in April 1967. Apollo 12's landing site had been chosen deliberately near Surveyor 3. The little lander had spent two and a half years exposed to the worst the Moon had to offer: harsh vacuum, intense cosmic radiation, meteoritic bombardment, extreme temperature swings. Back on Earth, NASA engineers wanted to know how metals, glass and other spacecraft building materials held up to that kind of punishment. Inspecting Surveyor 3 first hand seemed a good way to find out. 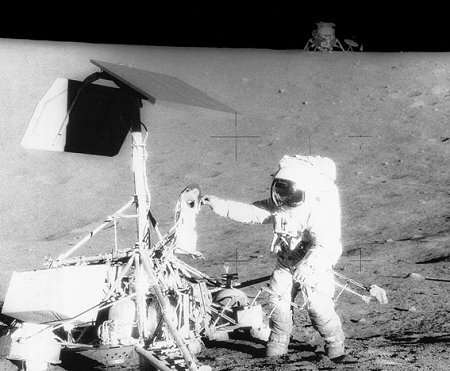 On their second four-hour EVA, Bean and Conrad walked over to Surveyor 3, took dozens of photographs and measurements, and began snipping off parts of metal tubing and electrical cables. They retrieved a camera. The very last thing they removed was a small scoop at the end of Surveyor's extendable arm, which had dug into the dry moon dust and gravel to make mechanical measurements of lunar soil. The little scoop, the camera, and other artifacts returned to Earth were analyzed and then put in storage. At some point in the intervening four decades, the scoop, owned by Johnson Space Center, was transferred on permanent loan to a space museum in Kansas. And there matters quietly lay ... until recently when researchers at NASA's Glenn Research Center (GRC) realized that that little scoop could hold big secrets. Namely, the secrets of digging on the Moon. NASA is returning to the Moon with plans to establish an outpost--and this will inevitably require some digging. The rocky, dusty lunar soil or "regolith" contains many of the natural resources humans need to live. For instance, there is plentiful oxygen bound up in ordinary moon rocks and, in polar regions, deposits of frozen water may lie hidden in the soil of shadowed craters. All that's required is a little excavation. But how? 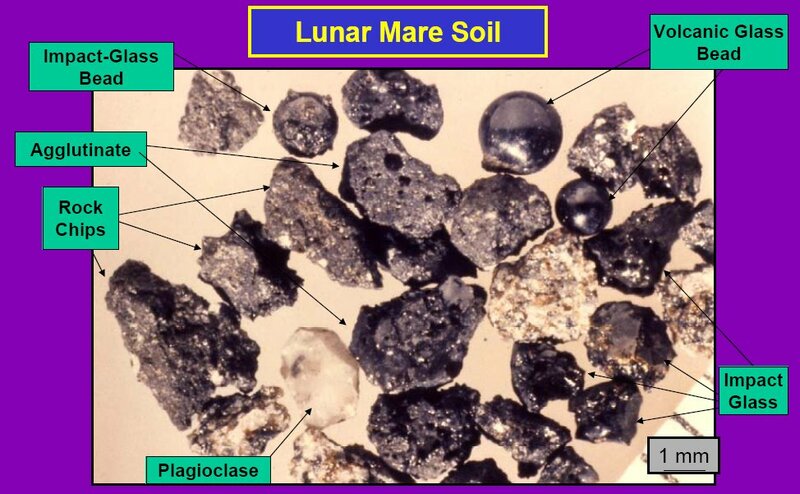 Lunar regolith is not like terrestrial soil. Here on Earth, the sand beneath our feet is shaped by a combination of biological and meteorological forces. Terrestrial soil is moist, rounded by weather, and utterly familiar. 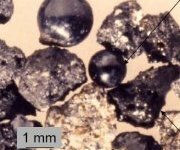 Lunar regolith, on the other hand, is a dry, glassy substance pounded into dusty smithereens by eons of meteoritic bombardment. It's not going to respond to a shovel--or a scoop--like terra firma.
. Photo courtesy of Larry Taylor, University of Tennessee. "To design lunar digging equipment, we need to predict the forces required to move a scoop or other implement through lunar regolith," says Allen Wilkinson, team leader of the ISRU (In-Situ Resource Utilization) Regolith Characterization team at the Glenn Research Center. Surveyor 3 and a sister ship Surveyor 7 actually dug into the Moon and measured how hard their drive motors had to work to scoop, press, and scrape the soil. To interpret those measurements more than 40 years later, however, Wilkinson's team needs to know the dimensions of the Surveyor scoops. Unfortunately, they learned, the blueprints had been lost! Only a scoop itself could provide the answer. 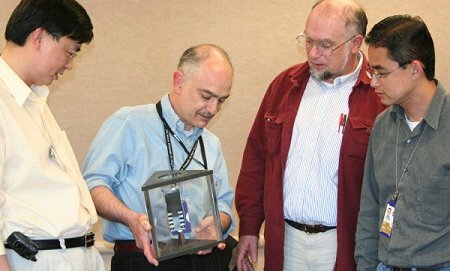 Above: Surveyor 3 scoop being examined by four of the members of the Regolith Characterization team; from left to right they are Xiangwu (David) Zeng, Enrique Rame, Allen Wilkinson, and Juan Agui. Copyright 2007 Trudy E. Bell. So the Glenn team borrowed photogrammetry apparatus from the Kennedy Space Center. Photogrammetry is a technique of measuring objects strictly from photographs. They have a photographic studio setup with a white background. GRC team member Juan Agui, an expert in digging force experiments, photographed the scoop in its container next to a standard photogrammetry cube, which has a precise checkerboard pattern on it. Then, using software, Robert Mueller of the Kennedy Space Center extracted dimensions using mathematical triangulation, measuring from points on the scoop to points where corners of dark checks meet on the cube. The software was developed for the Columbia Accident Investigation Board activity. Right: Surveyor 3 scoop inside its glass container. A fountain pen in the foreground gives the image scale. shows the interior of the scoop. Copyright 2007 Trudy E. Bell. "Photogrammetry is pretty good," Agui remarks. "We got measurements of the scoop accurate to 0.030 or 0.040 inch (~1 mm)." "Measurements of digging forces are underway," he says. 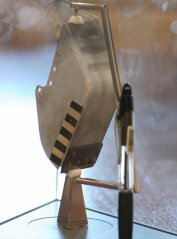 The replicated scoop plunges into a rectangular "soil bed" filled with JSC-1a, a man-made moondust substitute that closely matches the known properties of lunar regolith, while a computer monitors bearing forces. "Our team is quite pleased to find that the measurements appear to be close to reproducing [the best] Surveyor 7 data from the Moon." With this test bed in place, the team can, e.g., move forward to test alternate scoop designs and refine theories of lunar soil mechanics. "Obtaining the Surveyor replica really made the difference," says Agui. The secrets of digging on the Moon are being revealed. More about the Surveyor program: from NASA and from Wikipedia. The Surveyor 3 scoop is described in a 1971 paper "Examination of the Surveyor 3 Surface Sampler Scoop Returned by the Apollo 12 Mission," by R. F. Scott and K. A. Zuckerman. Caution: PDF is a large 35MB file. The Apollo Lunar Surface Journal for Apollo 12 -- The transcript for the second EVA, when Conrad and Bean cut the scoop off Surveyor 3, begins at 134:28:20; the scoop was removed from Surveyor at the very end, almost as an afterthought as it was not on the original list of items to be returned. Visit the Kansas State Cosmosphere and Space Center online at http://www.cosmo.org/. Several Apollo astronauts during their landings between 1969 and 1972 used a standard soil mechanics tool called a cone penetrometer to measure some of the regolith's mechanical properties in the top two feet (60 cm). So did the Soviet Luna and Lunakhod missions that landed elsewhere on the Moon. From the U.S. and Soviet data, soil mechanicians have indirectly calculated digging forces. Only two U.S. lunar spacecraft directly measured actual digging and trenching forces—direct measurements are the most accurate and useful for the design of lunar excavators: Surveyor 3 (which landed on Oceanus Procellarum on April 20, 1967) and Surveyor 7 (which landed near the crater Tycho on January 7, 1968). Those two Surveyor spacecraft included an extendable arm ending in a scoop (officially called the Soil Mechanics Surface Sampler). 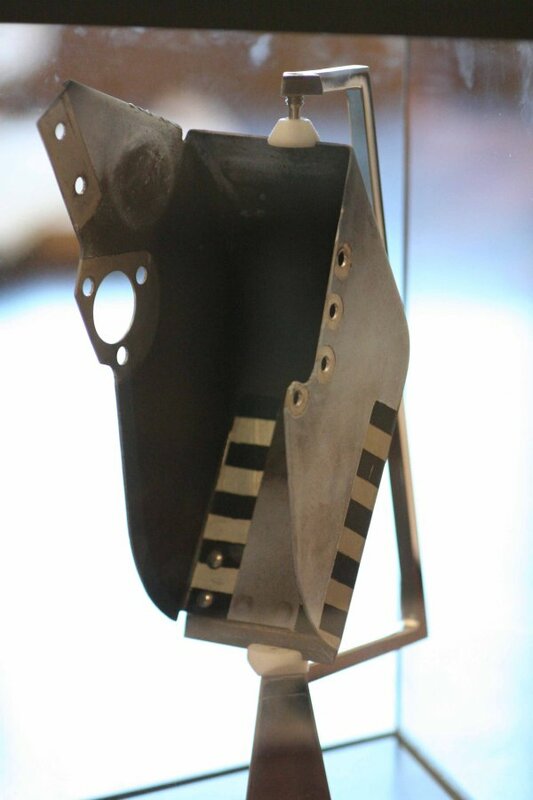 Among other tests, each scoop pressed vertically down to measure the regolith's weight-bearing strength, and pulled the scoop toward the spacecraft while bearing down to dig trenches. Only the data from Surveyor 7, though, were considered reliable enough to provide the needed digging forces. Over a year ago, the Glenn team calculated the expected digging force for the one published Surveyor 7 digging force measurement. But something was clearly wrong: their calculated predictions, based on the size of the scoop they had estimated from photographs, were 5 to 10 times smaller than what was actually measured on the Moon. That discovery motivated a year of effort to find all still-existing Surveyor digging data and artifacts, so the Glenn team could calibrate their experiments and benchmark the strength of their test soils. This detective hunt led the Glenn team to find video images of the Surveyor 7 scoop while digging, the actual returned Surveyor 3 scoop, possible data files with motor currents during other Surveyor 7 digging runs, and the paper calibration curves actually used in the 1960's to convert motor currents in into digging forces. The Glenn team learned that the Surveyor digger drawings were lost. They found two engineering prototypes of the scoop: one on display at the Smithsonian Air and Space Museum and one stored in the Garber Restoration facility. Glenn team member Juan Agui, an expert in digging force experiments, visited both sites to measure the scoops. To his consternation, he found the two engineering prototypes differed in crucial design details. But which one matched the actual flight units?